The heat is on as summer approaches, and many of us will be escaping it with the press of a button. Air conditioning is a big reason cities and suburbs can be built they way they way they are, but the cost of running an AC is high and the cost to the environment is even higher. 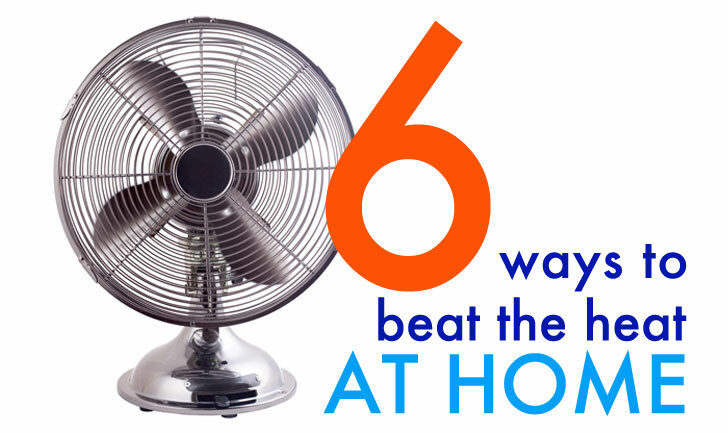 To help beat the heat in a sustainable way, we've rounded up a list of 6 things you can do to stay cool and keep your electric bill low -- all the while giving your electric company an opportunity to reduce their emissions and expensive equipment. From the simple stuff like window shades, to delving a bit further in and tuning-up your house, there are plenty of proven ways to cut the AC out of your summer without sweating. After the Fukushima Nuclear disaster, and resulting energy crisis in Japan, the government asked workers to not wear neckties and and other formal clothing to work. The obvious lesson here is that wearing weather-appropriate clothing makes it a lot easier to keep comfortable inside while dialing back the AC. The next step is to keep the heat out of your house to begin with. Covering windows with light colored blinds inside helps, especially on west windows that allow much more heat to permeate later in the afternoon. 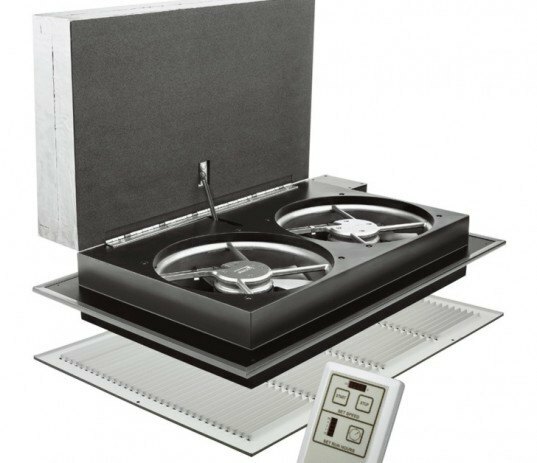 Another often overlooked heat source comes from electronics inside your house. Turning off the TV and flicking off the light switch goes a long way in keeping the heat down. Shades and awnings on the outside of windows are also incredibly effective ways to cool a home down, as are shade trees and other plants – particularly when they are planted on the west and east side of a home. Moving air, even a little, makes a big difference. Install a ceiling fan or use a portable fan to increase air circulation and to cool your room down in a low-energy way. Opening windows for cross-ventilation is effective as well, but try to avoid doing so during the peak of a heat day. If you live in a dry climate evaporative coolers can use 1/5 the energy of a typical AC — there are even ones like the Coolarado that don’t introduce moisture into the house. If you’re ready to pull up your sleeves, then consider adding insulation to your house and sealing the air leaks. Only after you’ve button up the home does it make sense to look at replacing windows – a task that can be complicated and expensive. Attic fans and radiant barriers are popular, but not proven to be very effective. 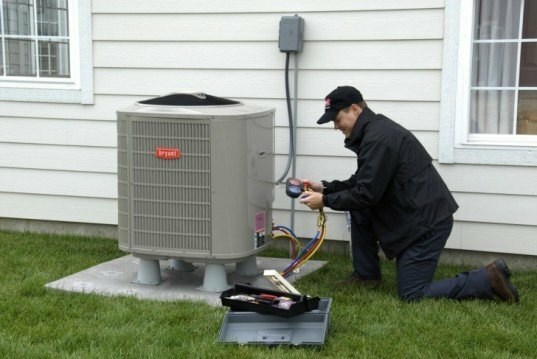 If you need to run the AC you can have the unit serviced by a professional to make sure it is operating in tip-top shape. Many utility companies happily offer discounts on air conditioning and heat pump tune-ups. Leaky duct work can also eat into the efficiency, so sealing ducts could make a big difference. If you’re on the market for a new AC, look for a high Seasonal Energy Efficiency Ratio (SEER) number and make sure the installer does not oversize it. Too often the ‘bigger is better’ approach leads to poorly running equipment that does not remove humidity very well. We’d also like to know your favorite ways to effectively beat the heat so share your ideas in the comments below! Keep sun off south/west facing patios and walls by installing a shade sail or growing a vine over a pergola. This prevents the heat building up in hard landscaping and walls, which keep the house warm into the night, and also heats the air that comes into the hosue at night when you open the windows. Grow plants like vines to shade your windows, add conservatory blinds inside your windows. Choose windows that open on the side. If they only tilt, then all you get is hot air rising up from the patio. The next step is to keep the heat out of your house to begin with. Covering windows with light colored blinds inside helps, especially on west windows that allow much more heat to permeate later in the afternoon. Another often overlooked heat source comes from electronics inside your house. Turning off the TV and flicking off the light switch goes a long way in keeping the heat down. Shades and awnings on the outside of windows are also incredibly effective ways to cool a home down, as are shade trees and other plants - particularly when they are planted on the west and east side of a home. GET THE AIR MOVING Moving air, even a little, makes a big difference. Install a ceiling fan or use a portable fan to increase air circulation and to cool your room down in a low-energy way. Opening windows for cross-ventilation is effective as well, but try to avoid doing so during the peak of a heat day. If you live in a dry climate evaporative coolers can use 1/5 the energy of a typical AC -- there are even ones like the Coolarado that don’t introduce moisture into the house. Moving air, even a little, makes a big difference. Install a ceiling fan or use a portable fan to increase air circulation and to cool your room down in a low-energy way. Opening windows for cross-ventilation is effective as well, but try to avoid doing so during the peak of a heat day. 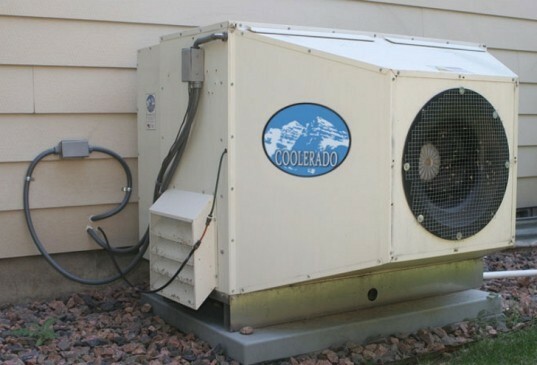 If you live in a dry climate evaporative coolers can use 1/5 the energy of a typical AC -- there are even ones like the Coolarado that don’t introduce moisture into the house. 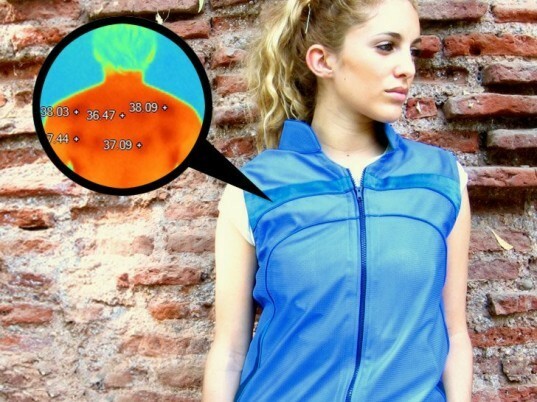 USE COOL NIGHTS TO CREATE COOL DAYS Many regions can be hot in the day, but cool at night. An effective way to keep out the heat in these climates is to do a night air flush. A well-sealed and insulated whole house fan is a great tool to complete this process. The fan draws in the cool evening atmosphere through open windows and flushes out the day's hot stuffy air. Close the windows during the middle of the day and a house can stay surprisingly comfortable. Many regions can be hot in the day, but cool at night. An effective way to keep out the heat in these climates is to do a night air flush. A well-sealed and insulated whole house fan is a great tool to complete this process. The fan draws in the cool evening atmosphere through open windows and flushes out the day's hot stuffy air. Close the windows during the middle of the day and a house can stay surprisingly comfortable. BUTTON UP THE HOUSE If you’re ready to pull up your sleeves, then consider adding insulation to your house and sealing the air leaks. Only after you've button up the home does it make sense to look at replacing windows - a task that can be complicated and expensive. 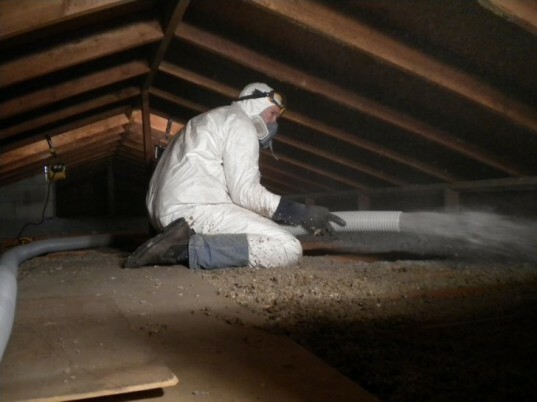 Attic fans and radiant barriers are popular, but not proven to be very effective. If you’re ready to pull up your sleeves, then consider adding insulation to your house and sealing the air leaks. Only after you've button up the home does it make sense to look at replacing windows - a task that can be complicated and expensive. Attic fans and radiant barriers are popular, but not proven to be very effective. If you need to run the AC you can have the unit serviced by a professional to make sure it is operating in tip-top shape. Many utility companies happily offer discounts on air conditioning and heat pump tune-ups. Leaky duct work can also eat into the efficiency, so sealing ducts could make a big difference. If you’re on the market for a new AC, look for a high Seasonal Energy Efficiency Ratio (SEER) number and make sure the installer does not oversize it. Too often the ‘bigger is better’ approach leads to poorly running equipment that does not remove humidity very well.